Saman is the story of how a Catholic priest in the world’s most populous Muslim country, Indonesia, becomes a human rights activist called “Saman.” Author, journalist Ayu Utami, turns the familiar tale of the crusader for justice on its head by folding Saman’s story into that of a group of young women who knew him when they were school girls and he a newly-ordained priest. Laila is the good girl who always falls for men she cannot have. Shakuntala the dancer who breaks her name in two for an American grant. Cok the bad girl exiled by her family. Yasmin the serious attorney trapped in a dull marriage. As these girls grow up and explore their sexual identities, the priest comes into his own, and with their help, is reborn. The story unfolds in layers, spanning the globe from one former Dutch colony (Indonesia) to another (New York), in only 180 pages. We read the story through several points of view, and through narrative, letters and emails. Watch for small details casually dropped along the way, as they add up to a powerful tale that is as much about the diversity of modern Indonesia as it is about any one person’s search for justice and freedom. 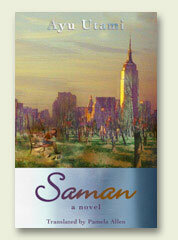 You can buy Saman at Skylight Books.